SCW CEC Online Video Courses allows you to gain continuing education credits (CECs) while broadening your fitness skills. Enjoy UNLIMITED STREAMING of your favorite presenters demonstrating the best of Group Ex, PT, Barre, Active Aging, Yoga, Aqua, Pilates and more! Accepted by SCW, AFAA, NASM, NPFT and other organizations, these courses include 24/7 streaming videos (filmed live at conventions), power point presentations, exams and downloadable certificates of completion. You’re Only a Few Steps Away From Your SCW CEC Video Course. 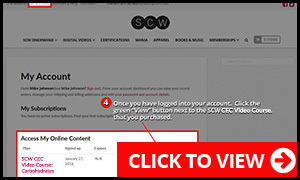 After purchasing a SCW CEC Video Course you must be logged into your account to access the materials. This applies to any and all products/services purchased in the SCW store. 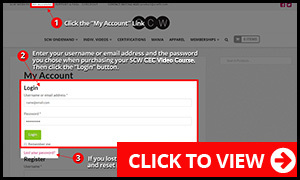 Go to the “My Account” section of the website and follow the link to access your purchased SCW CEC Video Course. Please follow the instructions below and always use the rule of thumb “When In Doubt…Visit My Account“. To access your SCW CEC Video Course you must be logged into your account. To log into your account click the “My Account” link. If you lost your password, you can always recover and reset it using the “Lost Password” link. Once you are logged into your account, click the “Memberships” button. Find the name of the CEC video course you purchased and click the green “View” button. This will give you direct access to your SCW CEC Video Course. Step 4: It’s Go Time! You now will have complete access to your SCW CEC Video Course. Follow the steps listed to complete your SCW CEC Video Course. This is a rule of thumb for any store purchase. Always visit the “My Account” section to access any purchased product/service. If you can’t remember your username and/or password, no problem! Click here to recover your password.